Traditionally served over linguine, this Shrimp Scampi Recipe makes a quick, easy and delicious dinner. This particular recipe came to me via a sister-in-law who decided to cook dinner for her family and my husband and me while we were vacationing in Montana together. It was so tasty, I asked her for the recipe. This shrimp recipe calls for medium sized shrimp. In the United States, shrimp is sold by the number of shrimp it takes to make a pound. In other words, the larger the shrimp, the fewer it takes to make a pound. This "sizing" is called a "count". For example, 16-20 count shrimp are an ounce each or a little less. The higher the count, the smaller the shrimp. The larger the shrimp, the more expensive they are, probably because of the extra time needed for growth and because of demand. I really don't know whether a larger shrimp (or prawns, depending on your country or regional preference) is better tasting than a smaller shrimp. I really think it depends on the quality of the shrimp you purchase and how you prepare them, rather than the size. I was also asked one time about why shrimp are frequently cooked and served with the tail on, as is the case with this shrimp scampi recipe. I can only guess at the answer. I believe that for whatever reason, it is traditional. But beyond that point, I also believe cooking the shrimp with the tail on actually adds to the flavor. After all, we can use seafood shells to make sauces and stocks. But if you prefer to remove the tails before cooking, I do not believe your meal will really loose too much flavor. Finally, leaving the tails on does provide some visual differences because the tails give your meal a certain textural difference that many people like. Preparation time: 30-35 minutes but if you purchase your shrimp already peeled and de-veined the prep time should be reduced to about 15 minutes. Serves 6-8. Reset heat to low and add shrimp. 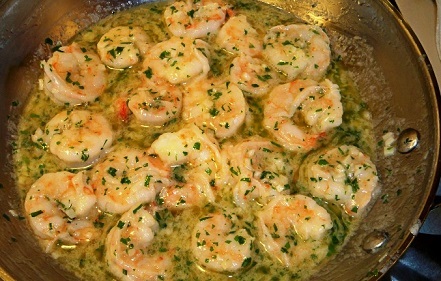 The shrimp should be added in a single layer on the pan (cook two batches if necessary or use two pans). My sister-in-law says she likes to serve this shrimp recipe over linguine or Angle Hair pasta. If you wish to do likewise, cook about 1 pound of the pasta of your choice. She then adds freshly grated Parmesan cheese on top. These shrimp are also excellent when served over rice. I have served both at the restaurant with excellent customer reactions. 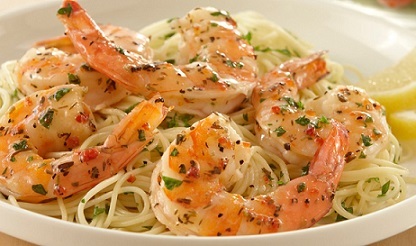 For a spicy shrimp recipe, click on Spicy Shrimp Scampi Recipe. Butterflying shrimp simply means cutting deeper into the back of each shrimp without cutting all the way through so it "opens" more during cooking. This allows the shrimp meat to more easily absorb seasoning and sauces. But be a little cautious because butterflying shrimp also makes them cook faster. 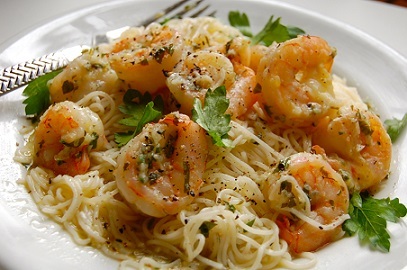 Enjoy your Shrimp Scampi Recipe and the company of those you share it with! Did you know? In the United Kingdom, the word "prawn" is more common on menus than "shrimp"; the opposite is the case in North America. The term "prawn" is also loosely used to describe any large shrimp, especially those that come 15 (or fewer) to the pound, sometimes known as "jumbo shrimp". Australia and some other Commonwealth nations follow the British usage to an even greater extent, using the word "prawn" almost exclusively. When Australian comedian Paul Hogan used the phrase, "I'll slip an extra shrimp on the barbie for you" in an American television advertisement, it was intended to make what he was saying easier for his American audience to understand, and was therefore a deliberate distortion of what an Australian would typically say.